This wedding with pink and white florals is absolutely lovely. We designed an opulent reception with roses, orchids, manzanita tress and a floral wall. Let me dive right into the details and let the pictures speaks for themselves. We designed 4 lush arrangements for the ceremony with white and pink roses with lovely white phalaenopsis orchids cascading down to create a simple and clean design. The reception had amazing tall centerpieces with pearls dripping down on the vases and a lush floral arrangement on top with white roses, pink roses and and those magnificent orchids. A unique design of incorporating names on silver frames mirrors for assigned seating was one of the fine details we incorporated in this wedding. Two family tables with hanging manzanita tress embellished with pearls, clear glass orbs, white dendrobium orchids, white phalaenopsis orchids stood tall and made a statement piece at the reception. Oh and my favorite, we designed a floral wall with white, cream and ivory paper florals and draped the back drop for the lovely Bride and Groom. Beautiful White and Blue Wedding. 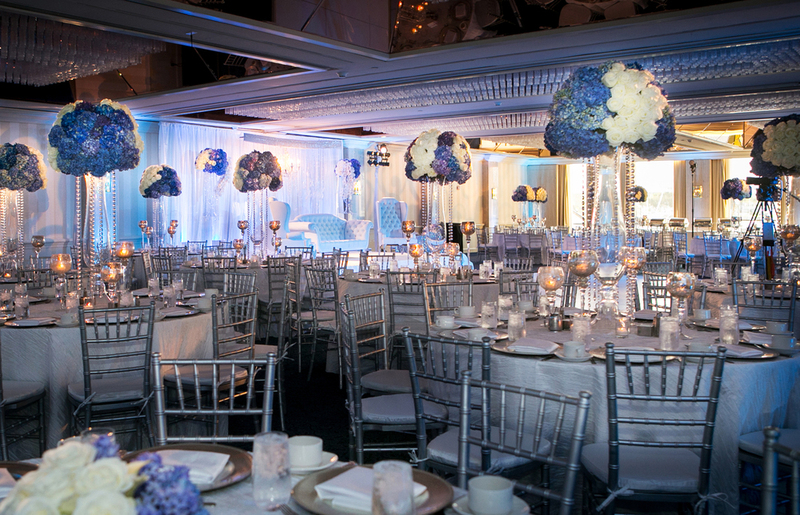 A lovely white and blue Indian wedding we designed at Sheraton Hotel and Marina. The couple had a private Indian ceremony just for family and had a lovely reception for family and friends. We designed a beautiful bouquet with white garden roses embellished it with an exquisite rhinestone trim. 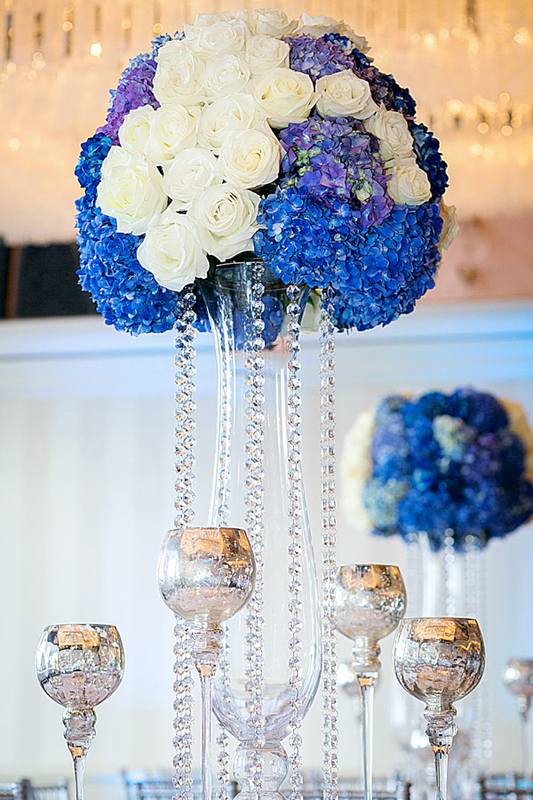 We incorporated her love for sequins, brooches, crystals with large display of white and blue florals set on clear glass vases dripping with multiple strands of crystals. A stage was set up with a white leather love seat and 2 white leather high back chairs from ArtQuest's personal lounge collection. 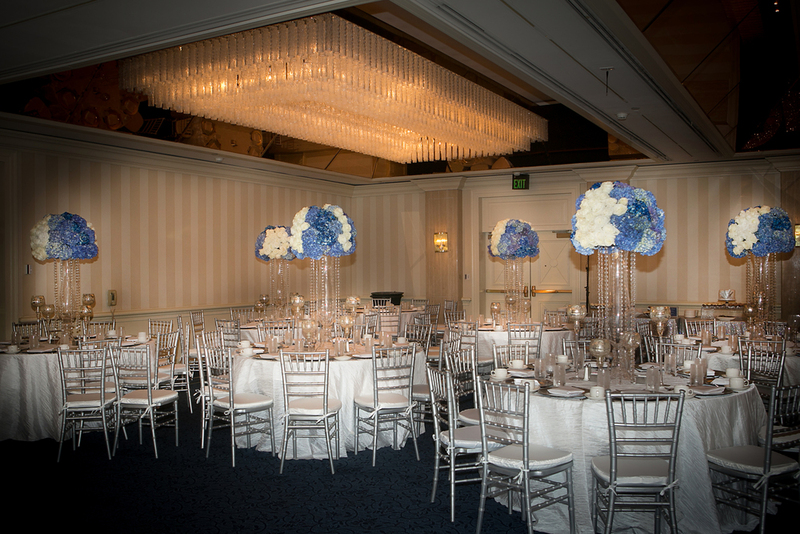 A exquisite back drop of hanging crystals with glass globes, and two arrangements on acrylic/plexiglass pedestals with crisp deep blue hydrangeas(which we are so much in love with) and white orchids cascading to give a simple yet opulent design. A huge thanks to Deborah Shields photography for exclusively capturing these images for ArtQuest.